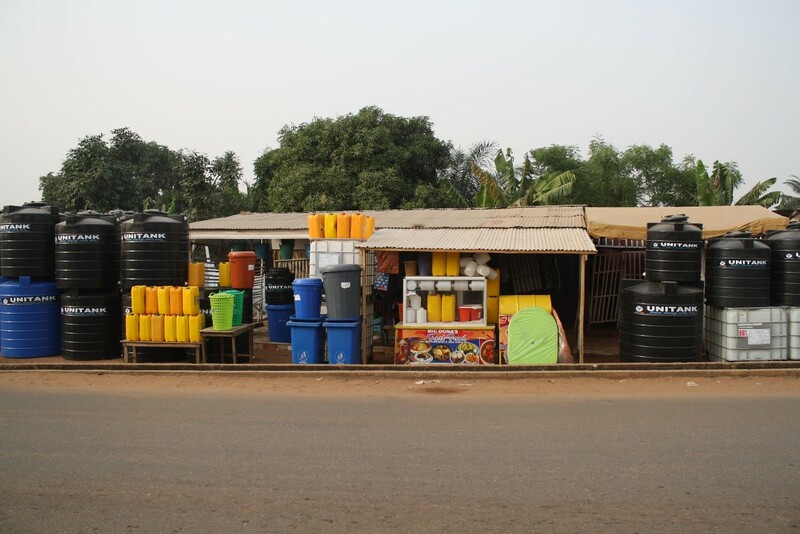 Despite the widespread presence of storage facilities, these find only limited space in analysis of the politics of urban water in Accra and elsewhere. Indeed, the attention is often concentrated on the circulation of water through large-scale networks of pipes, and on the history, uneven geography and intermittent working of networked infrastructure. Yet, as Millington (2018) recently showed for São Paulo, attending to the role of technologies of storage is important to understand the functioning of urban water systems and the relations between water use at the household level and water provisioning at the urban and regional scale. In contexts of drought and rainfall uncertainty, as in São Paulo, focusing on storage facilities plays a crucial role in understanding residents’ everyday experiences of scarcity, revealing their differentiated capacities to adapt/cope/deal with shortages. Additionally, it calls attention to state responses to (produced) water crisis. The role of common objects such as barrels and cisterns to store water is also underscored by Meehan’s (2014) study of water infrastructure and state power in Tijuana. These ordinary tools, she argues, work as stopgap measures for households but also “help create the conditions for material, self-organizing sites: in which rules, practices, and norms emerge in spatially embedded but autonomous ways” (p.8). What role does storage play in Accra? What story do buckets, storage tanks, jerrycans, and water sachets tell about the city and its water supply? All these water containers, and their presence in the streets, on rooftops, and on trucks, represent a tangible sign of the intermittent and uneven nature of pipe water supply across the city and the multiple ways through which urban dwellers have managed to establish access to water in the face of continued shortages. The use of storage facilities is not new; storage has been used since pre-colonial and colonial time when vessels and traditional clay pots were used to store water collected from wells and ponds. While the majority of people used buckets before the construction of networked infrastructure, the colonial administration financed the installation of large metal tanks in the bungalows occupied by European officials to store harvested rainwater (Bohman, 2010). When piped water supply reached the city in 1914, the use of storage facilities remained necessary for the majority of people who still got their water from public standpipes. Only wealthy individuals got an in-house connection (ibid.). Despite continued investments in the expansion of pipe-borne water supply by post-colonial governments, storing water has remained an important strategy to cope with intermittent water supply. The ubiquitous presence of storage containers is the material manifestation of the persistence of shortages. 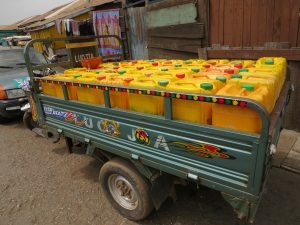 Recycled into water containers referred to as ‘Kufour Gallons,’ yellow jerrycans previously used for storing cooking oil are a symbol of the challenges of accessing water across the city. The jerrycans became popular improvised storage containers used by lower income households to fetch and store water in the face of water shortages that hit the country in the years preceding the privatisation of the utility. The water containers were named after the president of Ghana at the time, John Kufour (2001-2008). 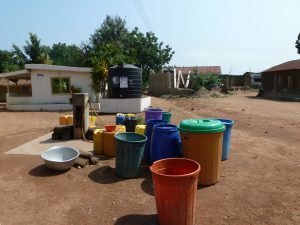 Together with ‘Kufour Gallons’, plastic buckets and storage tanks are also part of Accra’s storage infrastructure, all used by residents as measures to deal with intermittent (or absent) pipe water supply. But not all storage containers are the same and not all residents can afford to buy a storage facility or to purchase water to fill it. Indeed, how, where, and in which type of container water is carried and stored has important consequences for how residents access water in terms of quantity, quality and means of access. Buckets are used by low-income residents who are not formally allowed or cannot afford a domestic pipe connection. 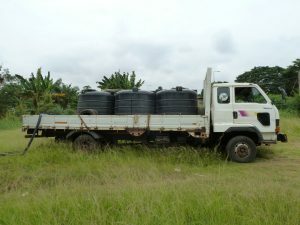 Excluded from direct access to tap water, these residents have no other choice than to fetch water from neighbours or standpipes installed by the utility (the Ghana Water Company Lmt., GWCL) and carry it to their dwellings with buckets.The size of the bucket indicates the price of water: sizes range from 25 to 45 litres and prices between 0,15 to 0,80 GHS (approximately 3-15¢). Prices vary according to the area, however, and pipe-born water tends to be more expensive than groundwater. 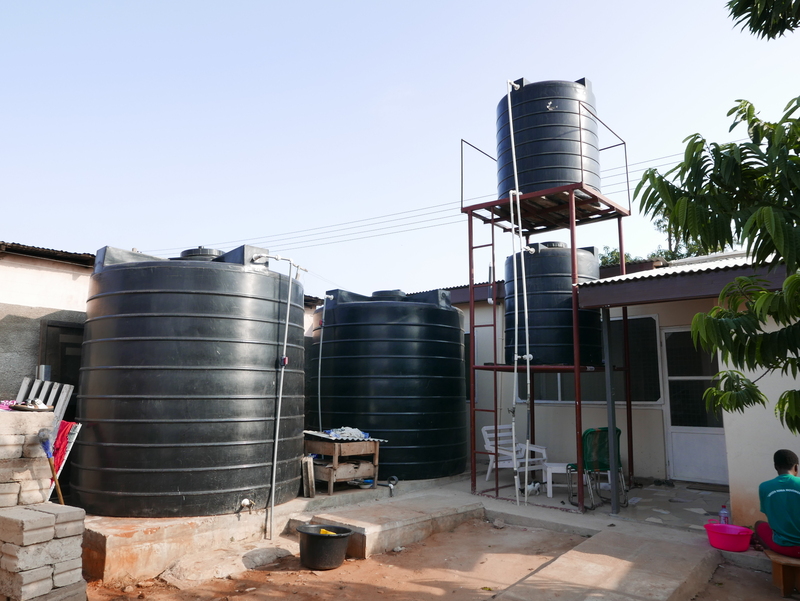 While low income households often rely on buckets, large storage containers to store water are installed by those who can afford to purchase or construct them, and have the space to accommodate these facilities within their dwelling. Besides being a material manifestation of the persisting inequalities in water access, storage infrastructure is also an important infrastructure for Accra’s water economy. It is precisely while researching the everyday practices of water vending that I realized the role that storage infrastructure plays in the daily work of vendors, tanker operators, and their customers: storage facilities allows for water to be purchased and resold in small and smaller units at varying prices (Bartels et al. 2018). This becomes clear when considering sachet water and ‘polytanks’. The former refers to 500 ml water packaged in polyethylene plastic bags; the latter refers to large plastic rotational moulded storage tanks of various shapes, colours and sizes. These take their name from Polytank Ghana Limited, a company that specialises in the production of plastic products that first introduced the storage tanks in Ghana in the early 1990s. In the last twenty years, sachet water has become an important source of drinking water for residents, daily commuters, and visitors of the Ghanaian capital (Morinville, 2017), and polytanks one of the most popular bulk water storage facilities. Both sachet bags and polytanks are used by resident to access water, but they are also a key infrastructure used for informal water provisioning. 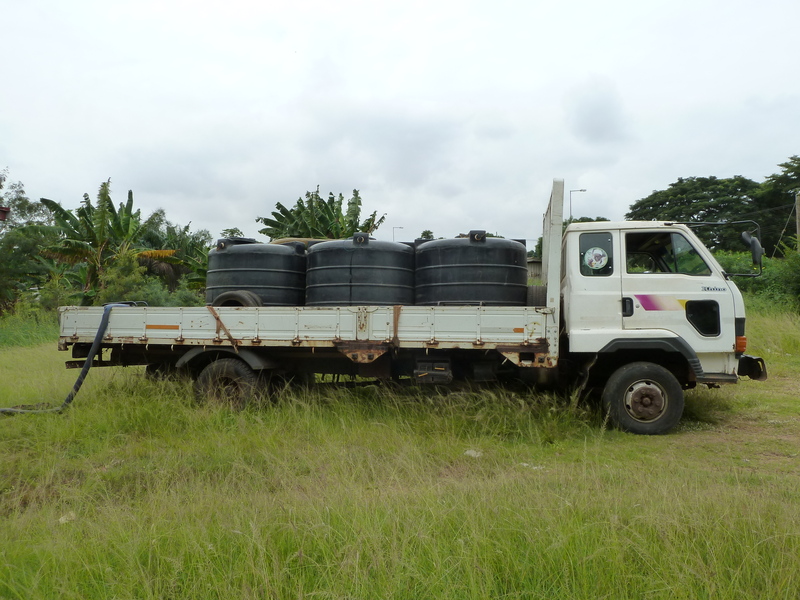 Mounted on trucks, polytanks are used by tankers to deliver water and by vendors to re-sell water to neighbours. They are also part of ´compound systems:’ micro-systems of pipes connected to a series of taps integrated in the outer wall of a house allowing them to sell water without customers entering their property (Alba and Bartels, 2016). While polytanks allow for selling water in bulk, sachet bags allow water to be sold in small units at the traffic lights, in specialized ‘water depots’ and in small stores. The sachet water industry is described as a vibrant industry employing a growing number of people both in large corporations and small family businesses, with its own National Association of Sachet and Packaged Water Producers (NASPAWAP). Following sachet bags and polytanks through their journey through the city makes visible the linkages between water provision and other material flows, particularly plastic, energy and waste. Both made out of plastic, sachet bags and polytanks are manufactured in Ghana from imported plastic. Energy is necessary to manufacture both sachets and polytanks, as well as in the packaging of water in sachets. Once used, plastic containers turn into waste. 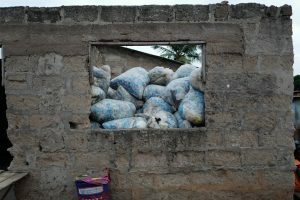 Sachet bags, in particular, have been at the centre of debates over the management of plastic waste – a long-lasting problem in Accra. Plastic Waste Management Programs have been introduced in the last years and informal waste pickers play an important role in recycling used sachet bags – collecting, separating sachet bags from other waste, and re-selling them to plastic industries. Yet, sachet bags “routinely clog urban gutters during rainy periods and cause flooding of open sewers” in turn exposing residents to a variety of water-related risks (Stoler, 2017, p.7). In this blog post I briefly outline what an exploration of urban water supply using water storing and storage facilities as a lens can offer. Buckets, storage tanks, jerrycans, or water sachets are not just objects but, like many other artefacts, they can tell stories and suggest new ways for grasping the complex and overlapping relations and transformations shaping life in the city. Looking at Accra through its infrastructures of storage contributes to moving beyond accounts of urban water inequalities that oppose pipe vs non-pipe as it draws attention to how residents, connected or not, resort to infrastructure other than pipes to secure their water access. It also calls for moving the analysis of urban water governance beyond water and including other materials and dimensions seemingly unrelated with the provision of water, such as plastic and waste management. In doing so, ‘thinking through buckets’ might help in the greater project of decentring the role of networked infrastructure and fostering a situated analysis of the politics of water in cities characterized by the persistent network fragmentation and the presence of heterogeneous arrangements for urban water provision (Furlong and Kooy, 2017; Lawhon et al., 2017). Alba R and Bartels LE (2016) Featuring water infrastructure, service provision and access in the Greater Accra Metropolitan Area. Bartels LE, Bruns A and Alba R (2018) The production of uneven access to land and water in peri-urban spaces: de facto privatisation in greater Accra. Local Environment: 1–18. Bohman A (2010) Framing the Water and Sanitation Challenge: A history of urban water supply and sanitation in Ghana 1909-2005. PhD Thesis, Umeå University. Umeå, Sweden. Furlong K and Kooy M (2017) Worlding water supply: thinking beyond the network in Jakarta. International Journal of Urban and Regional Research 41(6): 888–903. Lawhon M, Nilsson D, Silver J, et al. (2017) Thinking through heterogeneous infrastructure configurations. Urban Studies 55(4): 720-732. Meehan KM (2014) Tool-power: Water infrastructure as wellsprings of state power. Geoforum 57: 215–224. Millington N (2018) Producing water scarcity in São Paulo, Brazil: The 2014-2015 water crisis and the binding politics of infrastructure. Political Geography 65: 26–34. Stoler J (2017) From curiosity to commodity: a review of the evolution of sachet drinking water in West Africa. Wiley Interdisciplinary Reviews: Water 4(3): e1206.